A guest blog post by Dr. Stefanie Nigro who is an Assistant Clinical Professor at the University of CT School of Pharmacy. A few weeks ago, I was visiting my family in NY and ran into my old friend Kerri. Although it’s been a long time since I’ve seen her, I will always remember the first time we officially met. I ended up in the nurse’s office after scraping my knee playing kickball. While the nurse was attending to my cuts and scrapes, my 11 year old school mate was rushed in by our panic stricken teacher. I overheard my teacher say something along the lines of “low sugars” and “insulin.” The nurse was frantically looking for some sugar, so I offered my package of Skittles without question. I came to learn that day that Kerri had diabetes. What I didn’t expect to learn is that Kerri wouldn’t be the only person in my life to be stricken with this deadly disease. I was reading recently that 26 million (yes, million) Americans are currently diagnosed with diabetes. If that number wasn’t scary enough, another 79 million (no, I’m not kidding) are at high risk of developing diabetes. To further complicate matters, most people who are at risk don’t know it. That’s why I am happy that it’s that time of year again…no, not Christmas…National Diabetes Awareness month! The month of November is a great time to communicate with others about the seriousness of diabetes and the importance of prevention. This year, the message is loud and clear. 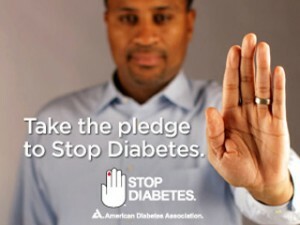 The American Diabetes Association is asking all people to “raise their hand to stop diabetes.” All people, those with or without diabetes, are asked to make a pledge to take action against this life-long disease. People are encouraged to learn more about getting tested, engaging in regular physical activity and eating healthier. A few small changes can make a big difference. To help kick off this great month, the Community Health Center of New Britain and Meriden will be hosting two event filled days to help raise diabetes awareness. Both days, November 9th and 18th respectively, will include a diabetes education session, food demonstrations (I’m getting hungry already) and tons of giveaways and food samples. Patients are encouraged to come and learn tips on how to prepare healthy meals, how to safely use medications and how best to live with this disease. Both events will take place in the lobby from 10 am – 3:30 pm. It’s going to be a great time! Hope you can join us.